I develop Matlab-based numerical ProShell suits that combine finite-element methods, which solve the mechanical behavior of the lithosphere, data assimilation, and graphical representation. The method behind these suits includes a thin-sheet approach to model lithospheric stresses and deformation and a thin-shell approach to account for particular (spherical/crumpled) geometries of the lithosphere. ProShell was developed to model lithospheric stresses in the African plate. It was also applied to model dynamic evolution of landscapes of Greenland’s passive margins caused by intense glacial erosion. My recent project involves analysis of processes of erosion and sedimentation linked to isostasy within the North Sea realm. Sergei Medvedev received his MS in Mechanics (1986) from Moscow State University (Russia) with a thesis focused on numerical modeling of convection. After obtaining his MS degree, Sergei started working on the theoretical aspects of so-called “thin-sheet approximation,” one of the numerical methods in geodynamic modeling, at Moscow State University (1986–1989). He moved to industry for a few years (1990–1994) where he worked as a mathematician (Oil Recovery Company, Ufa, Russia), but returned to his original interest and completed a PhD program in “thin-sheet approximation” modeling at Uppsala University (Sweden, 1993-1998). 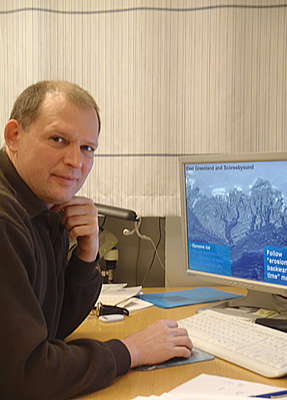 From there Sergei moved to Dalhousie University (Halifax, Canada, 1998–2002) where he worked as post-doctoral researcher on the modeling of orogenic systems (wedges, plateau, salt basins). From 2002 to 2005 he worked as a post-doctoral researcher at the Free University (Berlin, Germany), developing the models of evolution of South American Andes. Since 2006 Sergei has been working as a researcher at PGP (University of Oslo, Norway) applying thin-sheet and shell models to understand stresses and landscape evolution on lithospheric scale areas (African plate, Greenland, North Sea realm). He also developed some aspects of shear-heating instability in application to mid- to deep earthquakes.